Puzzle their brains with a little word scramble activity. Perfect for early finishers or as a fall activity the whole class. 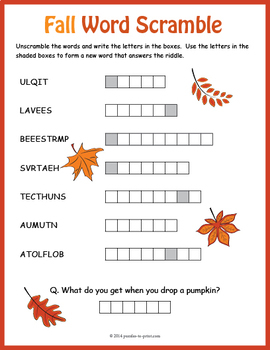 Kids will be reviewing spelling of autumn vocabulary words as they work on unscrambling them. This puzzle comes with an extra challenge. Once puzzlers have unscrambled the words they must use the letters in the shaded boxes to form a new word that answers the riddle. Puzzles to Print guarantees you the highest quality crosswords, word search, cryptograms, Sudoku and number puzzles available.